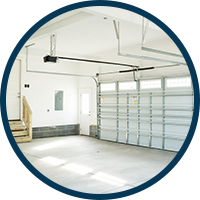 Garage Floor Coating - Top 8 Mistakes On Coating Your Garage FloorGarage Interiors, Inc.
Garage floor coating is a craft that requires professional experience, knowledge, and skill — that is, if you want it done correctly for long-lasting results. 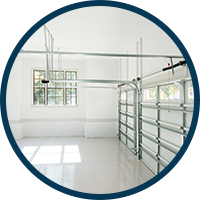 These days, many homeowners attempt to take matters into their own hands when it comes to things like installing garage organization systems and coating their garage floor, which often results in costly mistakes that could have been avoided with a professional garage coating service. Trust us when we say the last thing you want is to spend hours on a do-it-yourself garage floor resurfacing project, only to end up using the wrong materials or to have the flooring cure incorrectly and crack or peel in a matter of weeks. At Garage Interiors, our team has years of experience installing “Better-Than-Epoxy” garage flooring in both residential and commercial garages, and we are more than equipped to handle any garage floor resurfacing project in Southeast Wisconsin and Northern Illinois. That being said, we also deal with our fair share of botched DIY garage floor coatings, as many homeowners learn the hard way that, in order to get a quality garage floor, you must hire a professional garage floor coating company to do it right the first time. 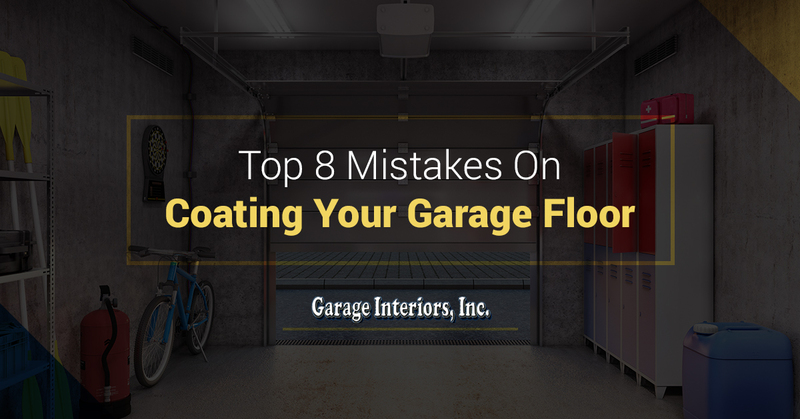 Here are the top eight mistakes homeowners make when attempting to recoat their garage floor themselves. Correctly preparing your garage floor for a fresh coating is an essential first step that many homeowners skip if they don’t know what they’re doing, which can have a significant negative impact on the outcome. In fact, most homeowners don’t even have the tools to properly prepare their garage floor, leading them to dump acid on the surface or simply give it a quick wash with the garden hose. When you hire a professional garage coating company, they will use mechanical diamond grinding to prepare the concrete so the coating can bond to it and form a strong, sturdy layer. 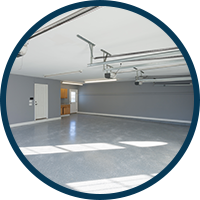 Regardless of the type of garage flooring you use, the results of how well the coating bonds to the concrete are dependent on how well the surface was prepped. Many hardware stores carry big-box garage floor coating materials for homeowners who prefer to do things themselves. Though you may consider yourself handy and capable of the job, you must know enough about garage floor resurfacing to be able to select the right materials. If you do not use the proper chemicals on your garage floor, you’ll very likely end up redoing the floor several times over the next decade. This will end up costing you more in the long run (not to mention all the time you spend), since one professional garage floor coating can last up to 15 years in residential garages. That’s why it’s better to spend a little more money upfront on a quality garage floor coating service — our technicians have years of industry experience, so they know exactly what chemicals to use and how to apply them for maximum durability. Plus, you won’t have to lift a finger if you experience any issues down the road because we offer warranties on all of our Slide-Lok polyaspartic floor coatings! Garage floor coating technology has come a long way over the last decade, as companies like Slide-Lok have released high-quality garage flooring materials that are far more effective and long-lasting than traditional epoxy. Yet, many homeowners are not aware of this and stick with the old way of doing things, which is to use an epoxy garage coating system. This creates three distinct layers that can peel away from each other over time, resulting in the need for a professional garage floor coating company to redo it at some point. To avoid this, make sure your freshly coated garage floor creates a “single solid” once it is cured, meaning that the layers form a durable bond that does not split apart. The best garage flooring system for this is called polyaspartic, which penetrates deeper into the concrete with fully bonding layers that resist peeling. While the makeup of the end result may be chemically the same, lots of homeowners don’t know the difference between various kinds of polyaspartic floor coating. The main differentiators are the working time, cure time, return to use, and even the depth of penetration into the floor, which can vary based on the additives used to make the polyaspartic resin and solvent. Of course, this affects the entire garage floor resurfacing process, and only a professional will know how to properly apply each type of polyaspartic flooring. The same goes for warranties — not all homeowners know the difference between a company warranty and manufacturer’s warranty, which can make all the difference when it comes to investing in a freshly coated garage floor. Don’t be fooled by companies that offer a warranty that isn’t backed by the manufacturer of the actual garage floor coating product, as the warranty is only as good as the manufacturer behind it. A manufacturer’s warranty ensures that the product is held up to the manufacturer’s standards and that you receive the best floor possible, and Slide-Lok offers a prime example of this. Two-coat garage flooring systems pose a growing concern to those of us who have been in the industry for decades, as they bring the price down by only using two coats, resulting in a poorly coated garage floor. These cheap garage floor coating materials are often used by new garage companies and DIYers who are looking to cut corners, which results in the base coat (which they broadcast into) sitting directly under the top coat. The issue is that the base coat does not have the ability to be both the coat that bonds with the concrete and the medium that holds the decorative chips, which causes the garage floor to degrade and need replacing in the next few years. Obviously, it is more costly to have your garage floor coated twice than it is to have it done the right way once, so don’t waste your time and money on these two-coat systems. This goes back to the layered system. Since the full polyaspartic polyaspartic floor coating systems have been out, many epoxy garage flooring companies have changed their top layer (or hardener) to a polyaspartic material as a means of raising prices because the top coat is stronger. However, just because the top layer of the garage floor coating is polyaspartic doesn’t mean the coating has the benefits of a “single solid” polyaspartic system, which uses only the polyaspartic floor coating material that binds together to create one solid, impermeable layer. As the Top Rated Local® garage floor coating business in Southeast Wisconsin and Northern Illinois, we use full polyaspartic flooring systems for all of our residential and commercial projects. Last but certainly not least, one of the most common mistakes people make when coating their garage floor themselves is using an overlay, which is a decorative finish that lies overtop the existing garage floor. The problem with this is that if the concrete underneath (called the substrate) is not solid, the overlay will chip, crack, and ultimately fail. Not only will the garage floor coating fail if the substrate is poor, but it will likely also delaminate, or peel away, because it did not bond properly with the concrete. As previously mentioned, the best way to avoid this is to invest in a quality garage floor coating service from the get-go by hiring a reputable company that only uses polyaspartic floor coatings. Ready to get started? Contact Garage Interiors today to take advantage of our winter garage floor coating specials! We are pleased to offer our services to residents and businesses in Brookfield, Franklin, Menomonee, Waukesha, and Pleasant Prairie, WI, as well as Grayslake, IL.